Manufactured by General Purpose Vehicles, the Colonel Truck was intended for military use in a radical attempt to change the technology behind producing more design purpose and survivability vehicles. This 2006 model now belongs to Ted Yadlowsky and his friends, making it the only privately owned amphibious combat vehicle in the world. 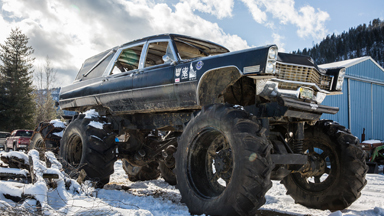 Nicknamed ‘the unstoppable force’, the truck is 26ft long, with eight giant wheels and bullet deflectors. Ted, from Lake Orion, Michigan, told Barcroft TV: “It’s very cool to say that I’m the only person with a privately owned amphibious combat vehicle. “The building process started back in 2000. GPV made around 11 vehicles that were designed or intended for the military. A lot of thought was put into these vehicles that made them decades ahead of similar class vehicles in the US military. “I think it took them close to three years in construction and that’s because this GPV Colonel that I have is a final production vehicle. Ted worked for a National Security Agency during his time in high school and later for many defence companies and DOD agencies, but his love for armoured trucks dates back to when he was a small child. He said: “Yeah, in high school, I was actually working for a National Security Agency so I’ve always been around certain military vehicles and have a lot of respect for those who have served. 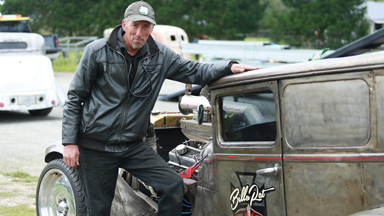 Ted hasn’t looked back since, making the truck his most-prized business asset. “I have been the one who has taken charge of getting the vehicle in the movies and doing special events,” Ted continued. 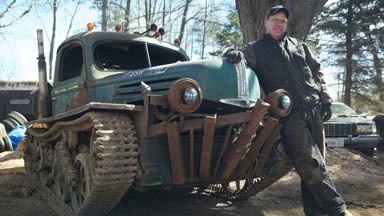 “The vehicle has featured in the movie ‘Red Dawn’ and a movie for Fox, which I’m not allowed to disclose yet. The truck can seat up to 10 people in the back and between four and six in the front. The motor is located in the center of the vehicle, which helps to reduce its infrared signature, allowing for more cooling from the air-conditioning system and it also helps balance the vehicle either on land or in the water. It has blinkers, headlights, high beams and extra fog lights – all in addition to the bullet deflectors that shred any shots fired. Ted said: “We have eight massive tyres with Detroit lockers in them and a massive diff lock system. This thing drives like a tank and is excellent off-road too. “You can see the armour-thickness, it’s well-protected. It has the nickname, ‘the unstoppable force’, because it will push through almost anything. “Its front-end was designed to go through one foot thick concrete walls and blast right through. It makes it very unique, we can go over a lot of big things. We can literally drive over a telephone pole and you won’t spill your cup of coffee. “And I would also like to mention the fact that it’s amphibious – it floats. We have pumps in the APU compartments, pumps in the centre, pumps in the engine compartment and pumps in the front. “We can literally drive it right into the water. We just need around 12 feet of water to be under it for it to float. Ted admits that because the truck remains street-legal, he often gets attention from members of the public whenever he takes it for a spin. “When it comes to driving it on the road and people’s reactions, they are always fascinated by it,” Ted said. “I mean, it’s not like everyday you get to go inside something that is futuristic. “As far as my friends and family go – they thought it was a crazy purchase. “I don’t like to discuss what we paid for it, because there were other things that we had to do to the vehicle to ensure safety.